The latest in our Out of the Hold limited-edition bottle-conditioned series is here! 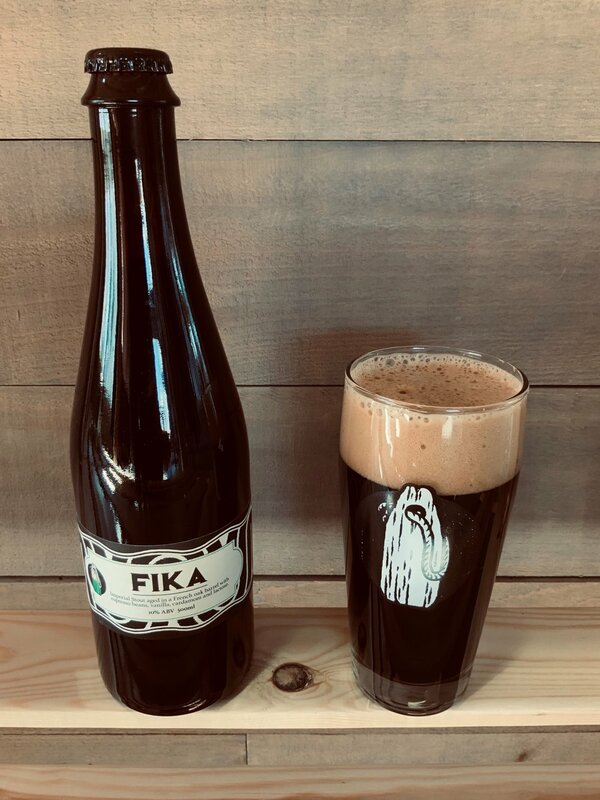 Fika is a Swedish-themed imperial stout aged in a French oak barrel with espresso beans, vanilla, cardamon, and lactose. At 10% ABV in a 500ml bottle, it’s a big, bold entry. More below! Fermented in stainless before being laid to rest for months in a French oak barrel. Prior to bottling the beer was infused with IKEA espresso beans, vanilla and cardamom. This bold, coffee stout was brewed to showcase the flavours one would experience in a traditional Swedish coffee break i.e. ‘Fika’. This is a beer with substance that is best shared with friends while eating past Swedish cardamom rolls (Kardemummabullar), IKEA Swedish meatballs, or Reindeer steak with lingonberry sauce. Coming soon! Our newest Out of the Hold releases. Out of the Hold is a program of limited-release, bottle-conditioned specialty beers in collectible bottles featuring original art by Paul Hammond. Available at our location at 21 Frazee Ave in Dartmouth, as well as in limited quantities at private liquor stores in the Halifax region. Watch this space for a release announcement, because the last batches went super quickly, and once they’re gone, they’re gone. January. Love it or hate it, it’s undeniably a dark and chilly month for the East Coast. And here we are in it. Boy, are we in it. But you know what else is dark and chilly? Our Abyss Black Lager. This traditional German-style Schwarzbier combines a malt profile with upfront notes of toasted grains, coffee, and chocolate malts, leading to an elegantly smooth finish. Big on flavour, but easy-drinking and sessionable as well. We’re kegging this seasonal bad-boy right now for distribution to bars and restaurants around the East Coast. Ask for it by name. Availability subject to how fast you all find it and drink it. Our retail store holiday hours -- so you don't end up out in the cold scratching at the frosty window to see if we're inside. Stock up on growlers and cans (for when you need that post unwrapping beer), our limited edition Out of the Hold bottle series (think beer collector stockings — UPDATE: Already sold out!! ), and lots of Toller (to keep the costs reasonable on New Year's)! Enjoy us responsibly and have a safe and happy holidays! Tore open the door with a bang a splash. Please enjoy Santa and his eight tinny reinbeer responsibly this holiday season! 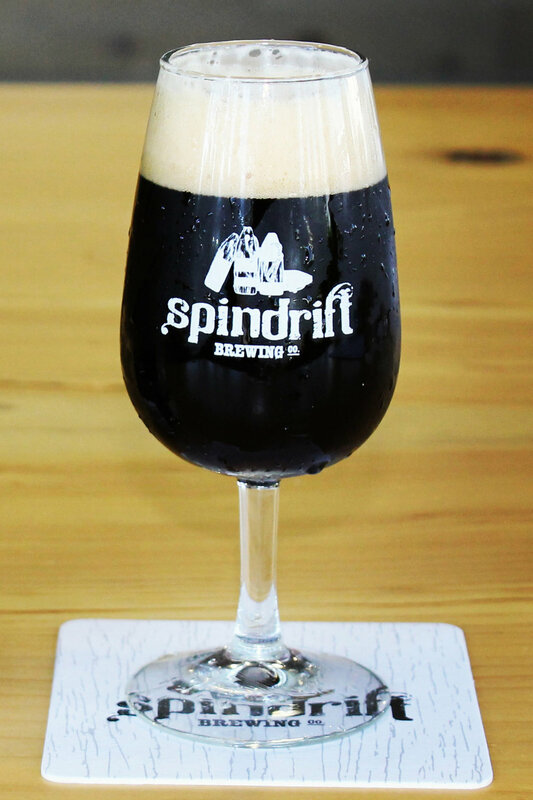 And remember, Spindrift makes you look cool at parties. Stock up before the chaos starts and you’ll be all ready for anything the end of December throws at you. From our family at Spindrift to yours, all best wishes for 2019! Double-mitting it in December, with Spindrift. Enjoy responsibly and have a fantastic holiday season!! ‘Tis the season of giving, and we need to make room for more new beer! So, while quantities last, you can get a 2-4 of Hurricane Juan DIPA for $69.99 (that’s $30 off the regular price!) and single cans are on for only $3.49! Imagine getting one of these in your stocking? At long last: our new website. Find our current beers, our locations and availability, and even a list of where you can find us in stores! Let us know what you think below. Tell us what you’d like to see here and we’ll work towards keeping the space lively and fresh. Follow us on Instagram, Facebook, and Twitter as well!